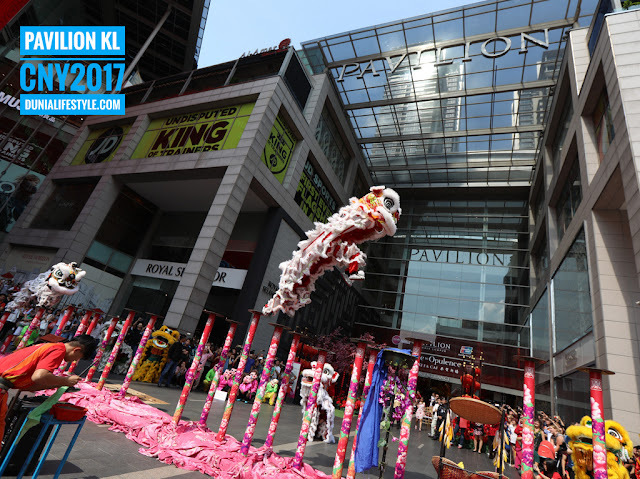 Pavilion KL, Malaysia’s premier shopping destination, today presented “The Rise to Opulence”, a breathtakingly abundant celebration of record-setting proportions in conjunction with the Lunar Year of the Rooster. Shoppers looking to attract good fortune can busk in Pavilion KL’s exclusive festivities while admiring Malaysia’s Largest Phoenix Replica at the mall’s iconic Centre Court. 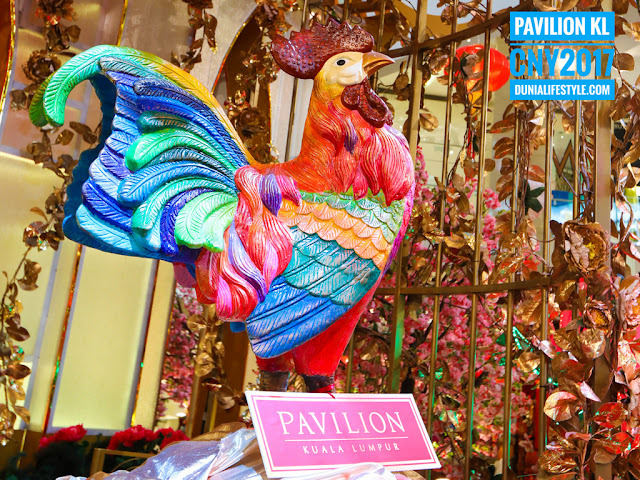 Promoting the notion that one’s hard work, passion and blessings will give rise to receiving opulence, Pavilion KL’s grand decorations this Chinese New Year portray the humble Rooster transforming into a Majestic Phoenix, rising high into the sky, full of pride and beauty. Take a walk under the Majestic Phoenix at the Centre Court and be bestowed with opulence and good fortune. 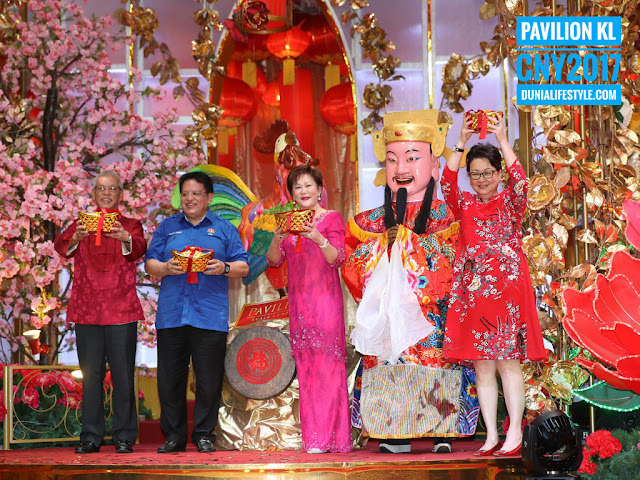 The much-awaited celebration was attended by Guest of Honour, YB Datuk Seri Utama Tengku Adnan bin Tengku Mansor, Minister of Federal Territories, Puan Sri Cindy Lim, Executive Chairman of Kuala Lumpur Pavilion Sdn Bhd, Datuk Lee Tuck Fook, Executive Director of Pavilion REIT and Dato’ Joyce Yap, CEO of Retail, Pavilion KL. 8 Prosperity Lions and Lucky Drums provided a thundering welcome to the guests, signifying an auspicious start to the festival. 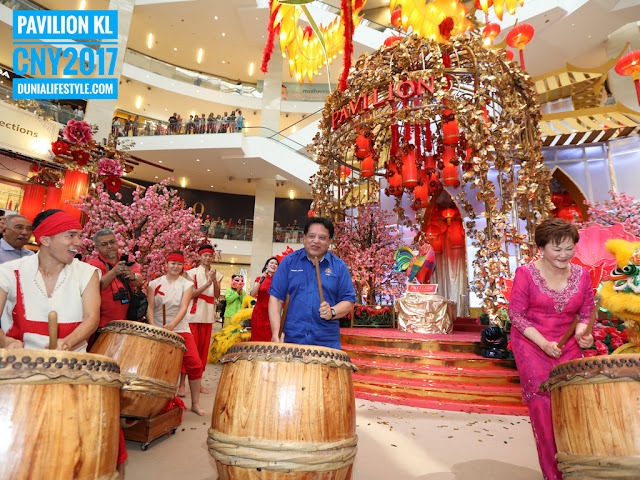 The launch was officiated with a strike on the auspicious ‘gong’ by Datuk Seri Utama Tengku Adnan and Puan Sri Cindy Lim to awaken the Golden Rainbow Rooster, as a symbolic gesture to usher in the Year of the Rooster. Shoppers are invited to stroke the Golden Rainbow Rooster to be blessed with prosperity and happiness this Lunar New Year. 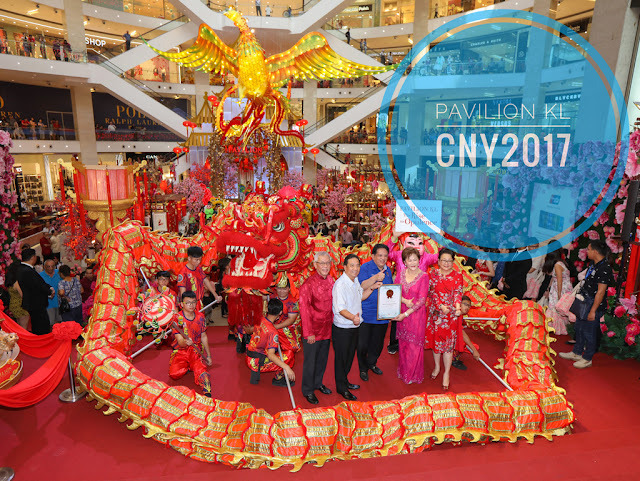 As with all signature festivals, Pavilion KL broke the records once again in the Malaysia Book of Records by presenting shoppers the ‘Largest Phoenix Replica’ in Malaysia, measuring 40 feet in length, 52 feet in width and 12 feet in height. Founder of the Malaysia Book of Records, Tan Sri Datuk Danny Ooi was present to award the honourary certificate to Puan Sri Cindy Lim. Guests were then treated to a powerful drum performance by award-winning local percussion group ‘Orang Orang’ Drum Theatre. To the delight of the crowd, the robust beating of the drums awakened the 88 foot long magnificent Dragon as it descended from the mall’s Spanish Steps, much to the amazement of the crowd. At the forefront of practising benevolent acts of giving and supporting the welfare of the community, Pavilion KL’s on-going “Charity at Heart” initiative (which has raised over RM2.6 million to date for charity), has once again dedicated a Lunar New Year CSR initiative to benefit Old Folks Homes and the needy organizations nationwide. 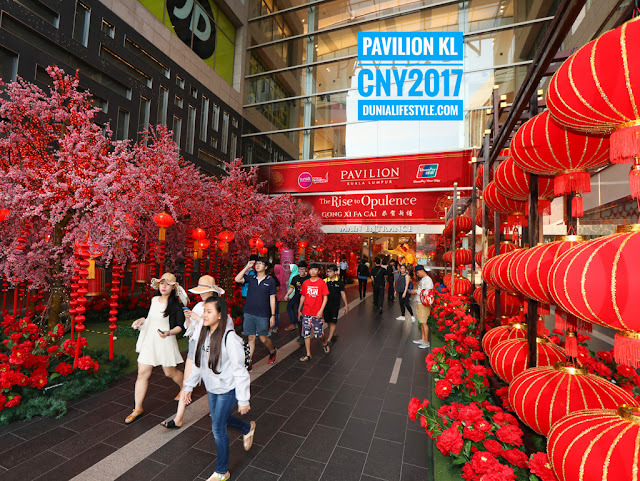 A Rooster Gallery is displayed at the Centre Court, where a myriad of Rooster merchandise is exhibited, exclusively sourced by Pavilion KL from around the world. 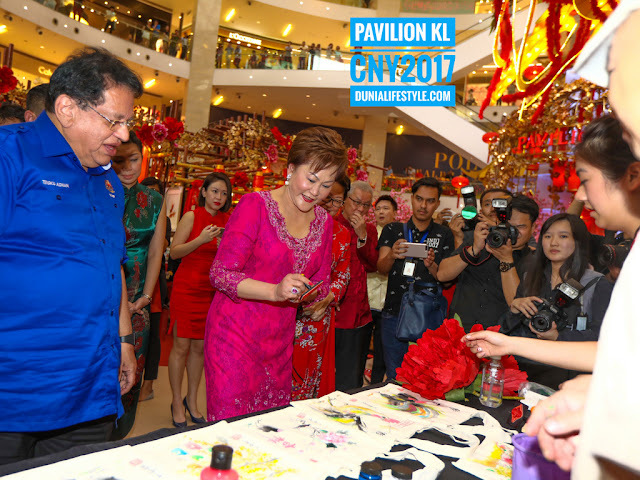 Specially selected to benefit charity, the ‘Dance of the Prosperity Rooster’ decorative plate is for presented to shoppers for a token sum of RM1,288, with proceeds going to old folks’ homes and needy organizations nationwide. With only 650 pieces created especially for Pavilion KL, the limited-edition heritage glassware from Turkey features an intricately painted design of a Rooster, handmade by master craftsmen. It is available exclusively at the Pavilion KL Centre Court in pearl, gold or silver finishes. Shoppers who are interested to do their part for charity can proceed to the Porte Cochere Concierge at Level 2 or call 03- 2188 8833 for more information. 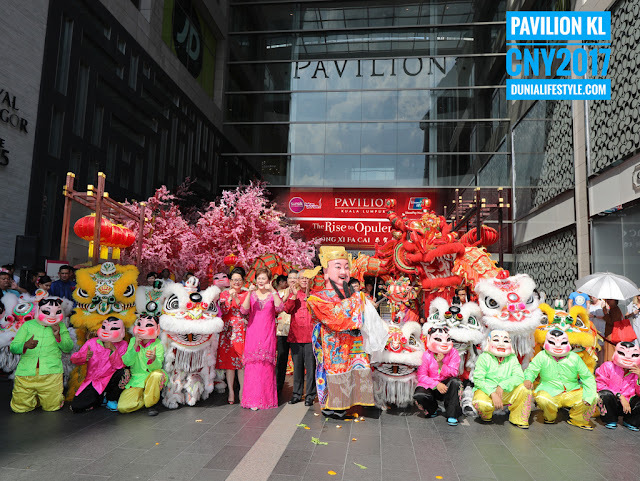 Pavilion KL’s “The Rise to Opulence” launch concluded with a thrilling acrobatic lion dance performance by World Champion Lion Dance Troupe Kun Seng Keng who electrified the crowd with an energetic rendition of their award winning act at the mall’s Bukit Bintang Entrance. 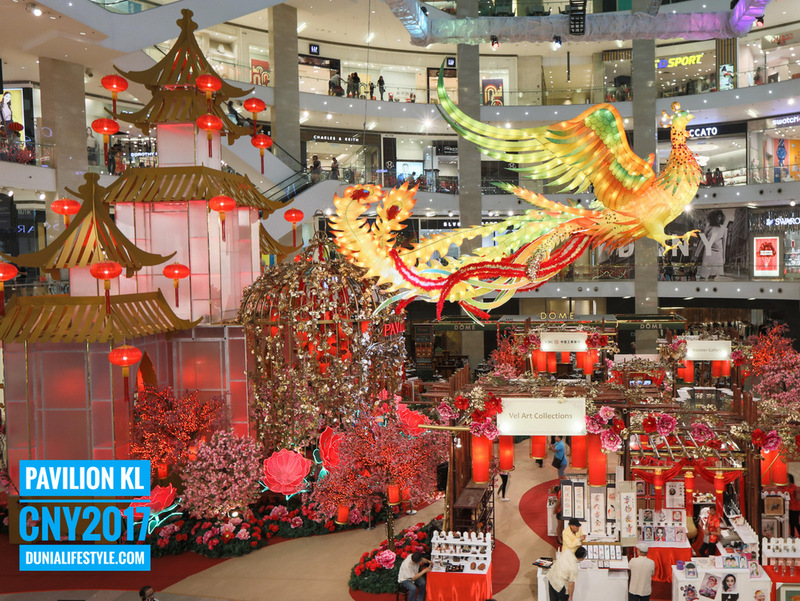 Shoppers can bring home the Prosperity Ang Pow with RM300 spent in a single receipt at specialty stores from now to 12 February 2017. UnionPay cardmembers enjoy more privileges this Lunar New Year! Redeem a TWG Tea gift with two cumulative receipts of RM800 spent with UnionPay Card (card no. starting ‘62’) from now to 12 February 2017. Busk in the delightful scent of spring flowers when you take a stroll at the Main Entrance, level 3, courtesy of festival partner, Sunsilk. Take a creative picture with the Sunsilk 3D bottle at the Main Entrance, upload it to Instagram or Facebook and stand a chance to win prizes.